With a beautiful coat of gray and rust-red, coyotes weigh an average of 30 pounds and are four to five feet long from nose to tail. 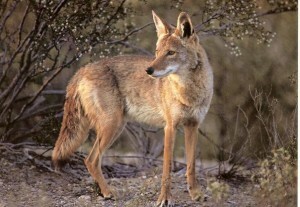 Coyotes are the largest member of the dog family found in Southern California. They are common throughout North America and expanding their range partly in response to human changes to the environment. The breeding season starts in January and ends in March. During this time, adult coyotes are getting ready to find a mate, dig dens and have a litter of pups. Known as “song dogs”, we can often hear the coyote’s nighttime yips and howls. Coyotes howl to communicate to other pack members – to coordinate hunts, establish territories and simply tell other coyotes where they are. All too often they have been given a ‘bad rap’, especially during the hay days of cattle ranching in the Wild West. Today, it is most often a pleasure to see coyotes as they remind us of North America’s unique wildlife. Coyotes hunt a variety of wildlife including brush rabbits (cottontails), ground squirrels, mice, bird eggs, and snakes. Coyotes also eat local nuts, seeds and fruit including California coffeeberry, manzanita, loquat, date palm and avocados. Especially during drought years, coyotes will look for food and water in our gardens, backyards, alleyways, parks and open spaces. Favorite non-wild foods include garbage, fruit from landscaped trees, and even the occasional small pet. To avoid attracting coyotes and increasing the risk of a conflict, please be sure that pet food and garbage are not left out overnight, fence in your garden and water sources (bird baths and sprinklers), and consider using motion-sensing outdoor lights. Small dogs and cats are occasionally taken by coyotes, so be sure to keep your pets leashed and inside at night. Coyotes very rarely attack humans. Based in Ventura, David Lee is a senior biologist with Davey Resource Group. For videos of local coyotes and to contact David visit www.facebook.com/davidleebio.